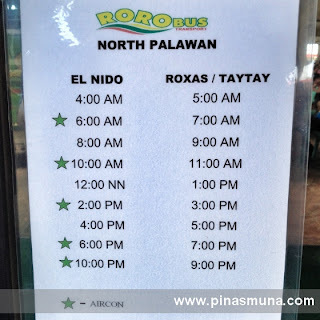 The most convenient and reliable way to travel from Puerto Princesa to El Nido is by taking the Roro Bus. 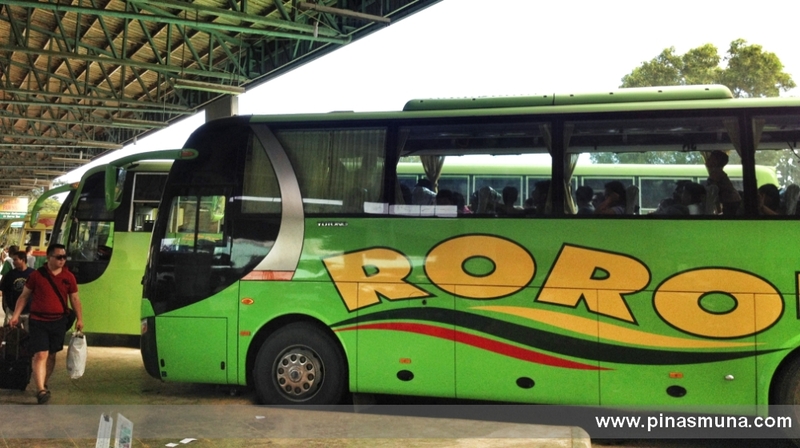 No, this bus will not board a RORO ferry, Roro Bus is just the trade name of the Batanggas-based Roro Bus Transport Services Inc that now serves the main island of Palawan. Roro Bus has its main terminal at the Puerto Princesa Land Transportation Terminal located in Barangay San Jose, Puerto Princesa City. Just take a tricycle and tell the driver to bring you to the Roro Bus Terminal. 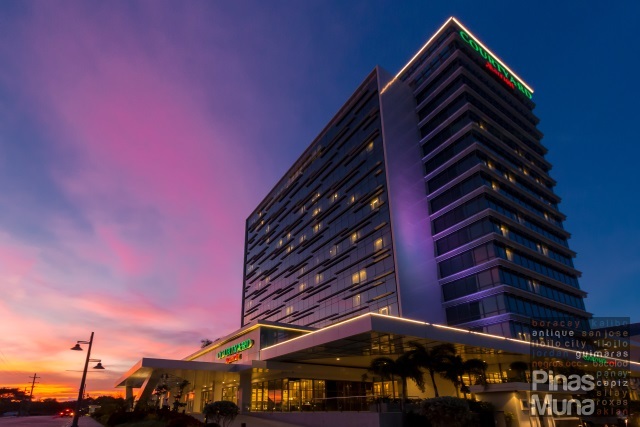 If you are staying overnight in Puerto Princes prior to your trip to El Nido, we recommend that you stay in GoHotels Puerto Princesa located near the Roro Bus terminal. Roro Bus has daily trips from Puerto Princesa to El Nido. 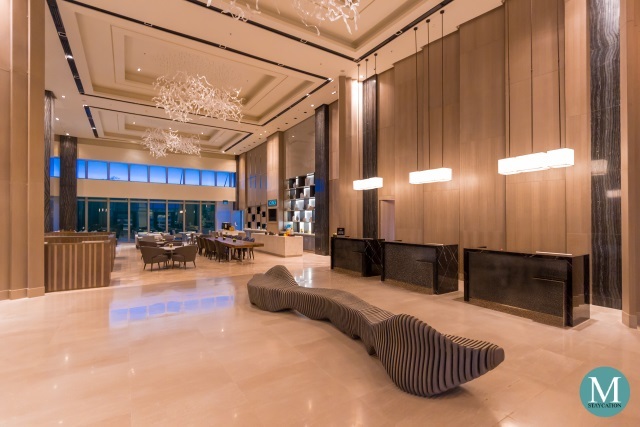 The first trip leaves at 4:00am with the succeeding trips leaving the terminal every two hours. The last trip is at 10:00pm. You can choose between an ordinary bus (non-airconditioned bus) and an aircon bus (airconditioned bus). 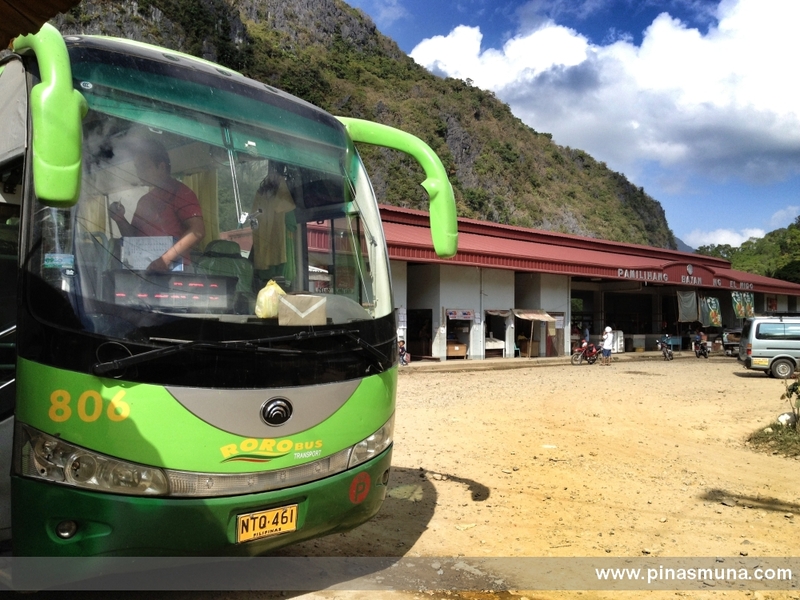 As of November 2012, Roro Bus fare from Puerto Princesa to El Nido is P367.20 for ordinary bus and P483.00 for aircon bus. Total travel time is 6 hours with stopovers in Roxas (15 mins.) and Taytay (15 mins). What we like about Roro Bus, and we hope that they keep it that way, is that their buses leave the terminal on schedule, and they arrive also on schedule. Their coaches also have enough legroom which makes the trip very comfortable. To boost tourism in the province of Palawan, several infrastructure projects were implemented by the Department of Public Works and Highways (DPWH) including the concreting of the Taytay-El Nido Road connecting El Nido to town of Taytay. The road-concreting project was nearing completion as of November 2012, with only a few dirt road sections left unpaved. The last 1.5-hours of the trip (between Taytay and El Nido) would be quite dusty so if you are sensitive to dust, we recommend that you take the aircon bus. The trip will end at the El Nido Public Market where Roro Bus has its terminal. As soon as you get down from the bus, we recommend that you book your return tickets for Puerto Princesa in advance at the Roro Bus El Nido Terminal (look for the waiting shed beside the police station, see image below). The dispatcher on duty may ask for a deposit which you can refund on the date of your trip back to Puerto Princesa. 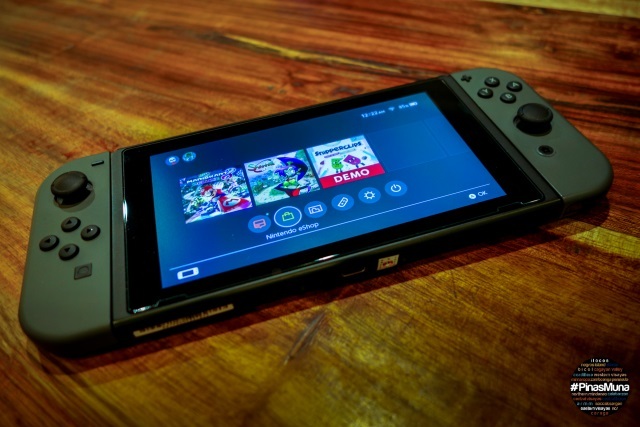 Don't forget to ask for a receipt for your deposit. Take any of the tricycles parked in front of the public market and tell the driver the name of your hotel/resort/inn. Standard rate is P10.00 per person but if you don't wish to wait for or share the tricycle with other passengers, you can pay the special rate of P50.00. 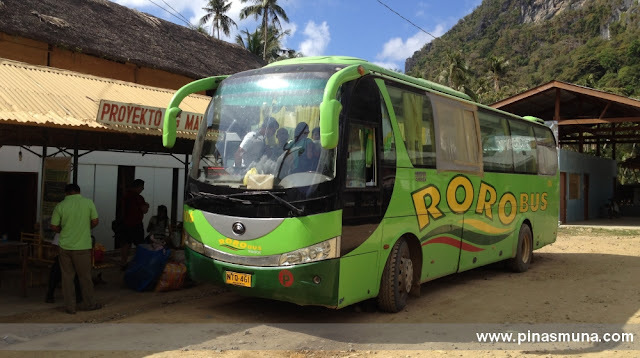 Roro Bus has daily trips from El Nido to Puerto Princesa (PPS). From downtown El Nido, take a tricycle and tell the driver to bring you to the Roro Bus Terminal. 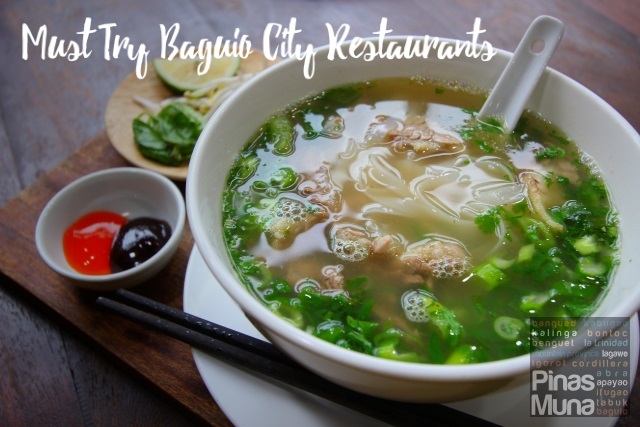 Standard tricycle fare is P10.00 per person. 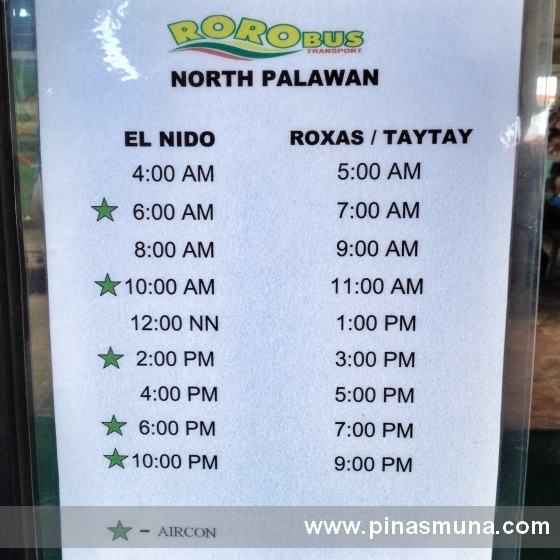 PPS-bound Roro buses also observe the same schedule as the PPS-El Nido buses. 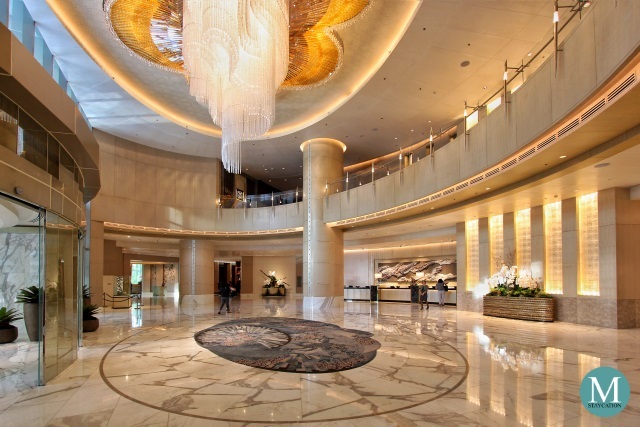 The first trip leaves at 4:00am with the succeeding trips leaving the terminal every two hours. Be sure to be at the terminal at least 30 minutes before the departure as Roro buses do leave the terminal as scheduled. 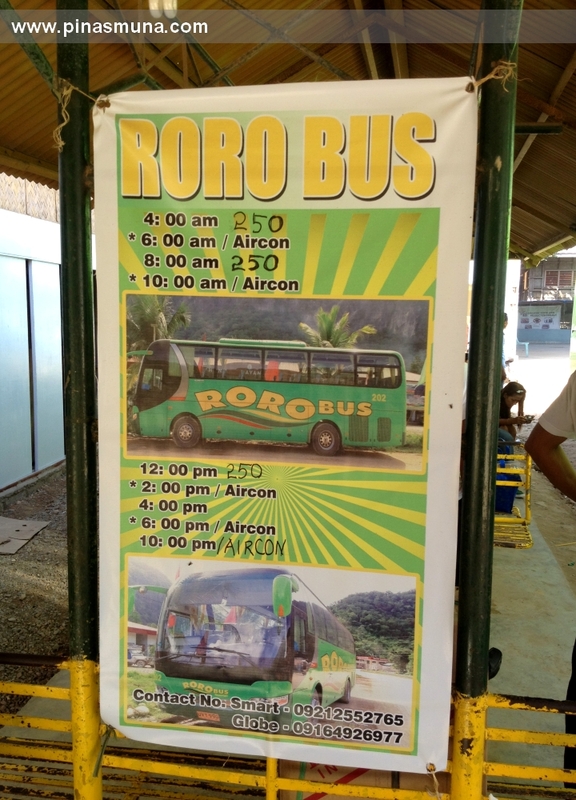 As of November 2012, Roro Bus fare from El Nido to PPS is P367.20 for ordinary bus and P483.00 for aircon bus. Total travel time is 6 hours with stopovers in Taytay (15 mins.) and Roxas (15 mins).